Thomaston, ME, February 23, 2010 Lyman-Morse Boatbuilding Co., builder of the ZeroBase, a renewable energy support unit, is proud to announce that two units have recently been deployed to Haiti. 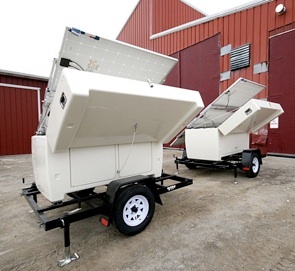 The ZeroBase units will be used to aid in the Haitian earthquake relief effort. Make It Right was founded in 200 by actor Brad Pitt following the devastation to New Orleans 9th Ward after Hurricane Katrina. Make It Right has recently played a large role in helping the victims from Haiti’s devastating 7.0 earthquake. The ZeroBase is an all-in-one, renewable energy converter and clean electricity generator. 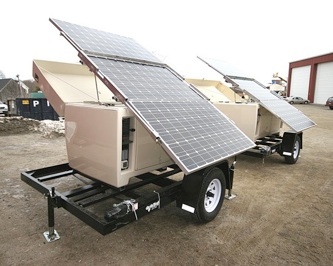 Designed to harness the sun, the ZeroBases provides primary or back-up power—on or off-grid—for short or long periods. Because they are mobile and require no fossil fuel or electrical source, they can be instrumental in providing immediate power where it is needed most. The H-Series unit provides 3500 watts of power replenished by 600 watts of integrated solar panels, with battery back-up capability up to 28,800 watt hours of power. Each Zero Base is valued at approximately $20,000. The ZeroBase began at Lyman-Morse Technologies, the research and development arm of family-owned Lyman-Morse Boatbuilding in Thomaston, Maine. Lyman-Morse has built custom yachts for over a century, and today expertly brings together old-world craftsmanship with state-of-the art technologies, including electronics, composite materials, complex engineering and marine-grade construction. Lyman-Morse currently has multiple units in production, keeping half a dozen people employed.